Nationality: American. Born: Gwyllyn Samuel Newton Ford in Quebec, Canada, 1 May 1916; grew up in Santa Monica, California. Education: Attended Santa Monica High School, graduated 1934. Military Service: U.S. Marine Corps, 1942–45; served in marine unit in Vietnam, 1967–68: colonel. Family: Married 1) the actress Eleanor Powell, 1943 (divorced 1959), son: the actor Peter Ford; 2) the actress Kathryn Hays, 1966 (divorced 1968); 3) the actress Cynthia Hayward, 1977; 4) Jeanne Baus, 1993. Career: Worked with Wilshire Theatre, Los Angeles; 1935—stage debut in The Children's Hour ; 1939—film debut in Heaven with a Barbed Wire Fence ; contract with Columbia; 1971–72—in TV series Cade's County , and series The Family Holvak , 1975; 1976—in TV mini-series Once an Eagle , and Evening in Byzantium , 1978. Agent: c/o Artists Group, 9200 Sunset Boulevard, Suite 318, Los Angeles, CA 90069, U.S.A.
Glenn Ford, R.F.D. Beverly Hills , with Margaret Redfield, Old Tappan, New Jersey, 1970. Interview in TV Times (London), 11 August 1977. Interview in Ciné Revue (Paris), 9 April 1987. "Glenn Ford in His House," in Photoplay Film Monthly , May 1972. "The Many Loves of Glenn Ford," in Photoplay Film Monthly , December 1972; see also January 1976. Marill, Alvin H., in Films in Review (New York), March 1978. Ciné Revue (Paris), 4 September 1980, 1 October 1981, and 26 July 1984. Hollywood Reporter , 20 November 1981. Curreri, Joe, "Glenn Ford—America's Real-Life Hero," in Classic Images (Muscatine), August 1993. 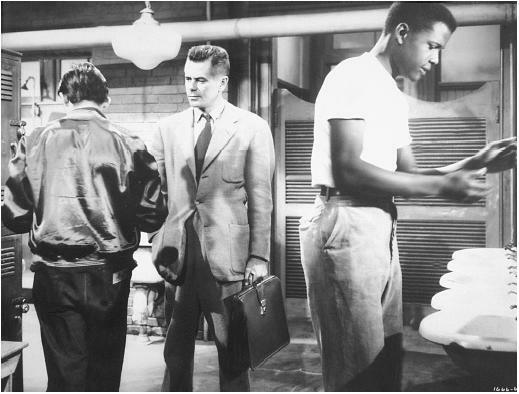 Glenn Ford's mouth is a scar of suffering, his eyes dim lights of introspection, and his voice expresses the cool, contemplative restraint of masculinity under control. In effect, he is somewhat drier than the heroes America wanted from the movies, and this may explain his secondary star status behind Gary Cooper, John Wayne, James Stewart, and others. His popularity took off with Gilda in the late 1940s, playing opposite Rita Hayworth—although it was George Macready to whom Ford observed, "I was born the night you met me." Ford mainly stayed within the melodrama/film noir tradition and did his best work in these genres. His most successful portrayals were in two films by Fritz Lang, Human Desire and The Big Heat , because it is in these films that Ford came closest to portraying the type of role he was usually denied—the antihero, the tarnished hero, the role so much associated with Humphrey Bogart. In Human Desire , Lang's remake of Renoir's La Bête humaine , Ford portrayed a man whose lust nearly leads him to commit murder. He steals for Gloria Grahame, and only the unexpected presence of a passerby prevents him from committing the act of murder—there is little moral choice involved. Ford is even more interesting in The Big Heat . Using his influence as a police officer and hiding behind the moral camouflage of a husband out to revenge the murder of his wife, Ford is responsible for more corpses than any of the film's "real" criminals. In a brilliant piece of plotting, Ford persuades Gloria Grahame to kill Jeanette Nolan, neatly sidestepping the act of murder himself. Unfortunately, after these efforts, Ford generally made what seemed to be bids for broader appeal and acceptance— The Americano , Cowboy , and The Gazebo with Debbie Reynolds. His appearances in a number of 1950s and 1960s Westerns bear some notice, though. In Delmer Daves's 3:10 to Yuma Ford is effective as an outlaw playing mind games with captor Van Heflin, while both await the title train. He is also interesting in Richard Brooks's The Blackboard Jungle , as a high school teacher in a tough New York classroom, and as a widower in The Courtship of Eddie's Father , with Vincente Minnelli in charge. Pictures such as these, and the Lang films, make it easier for us to forgive a career otherwise dedicated to an overeagerness to make banal statements on the American situation.